Lakhmir Singh & Manjit Kaur kaur Solutions for Class 10 Science Chapter 2 Magnetic Effect Of Electric Current are provided here with simple step-by-step explanations. These solutions for Magnetic Effect Of Electric Current are extremely popular among class 10 students for Science Magnetic Effect Of Electric Current Solutions come handy for quickly completing your homework and preparing for exams. All questions and answers from the Lakhmir Singh & Manjit Kaur kaur Book of class 10 Science Chapter 2 are provided here for you for free. You will also love the ad-free experience on Meritnation’s Lakhmir Singh & Manjit Kaur kaur Solutions. All Lakhmir Singh & Manjit Kaur kaur Solutions for class 10 Science are prepared by experts and are 100% accurate. (a) Define magnetic field lines. Describe an activity to draw a magnetic field line outside a bar magnet from one pole to another pole. (b) Explain why, a freely suspended magnet always points in the north-south direction. Magnetic field is the space around a magnet wherein magnetic force can be felt. The magnetic field lines of a bar magnet can be mapped using a magnetic compass. The compass can be moved from one pole of the bar magnet to another pole. We can trace the field lines by moving the compass gradually and drawing a corresponding line which the compass would trace while following a particular line of force. In this activity, we will get a magnetic field pattern around the magnet. This also allows us to see the magnetic field lines leaving the north pole of the magnet and enter its south pole. (b) A freely suspended magnet always points towards geographical north and geographical south directions because of the magnetism of the earth. It is assumed that a huge bar magnet is placed at the centre of the earth that causes a freely suspended magnet to align in the directions of north and south poles. If a strong bar magnet is placed vertically above a horizontal wooden board, the magnetic lines of force will be along all planes around the magnet. Magnetic field lines produced by a bar magnet originate from the north pole and end at its south pole. Brass is not a magnetic material. The magnetic field lines do not cross one another because the resultant force at any point on the north pole can only be in one direction. This is impossible if the lines intersect. The north pole of earth's magnet is in the geographical south because it attracts the south pole of a freely suspended magnet. The axis of earth's magnetic field is inclined with the geographical axis at an angle of about 15⁰. State any two properties of magnetic field lines. 1. They originate from the north pole of a magnet and end at the south pole. 2. They do not intersect one another. What are the two ways in which you can trace the magnetic field pattern of a bar magnet? 1. Using iron filings: In this process, iron filings show the shape of magnetic field produced by a bar magnet by aligning with magnetic field lines. 2. Using a compass: With the movement of compass from one position to other, magnetic field lines leave the north pole of the magnet and enter the south pole. You are given the magnetic field pattern of a magnet. How will you find out from it where the magnetic field is the strongest? Magnetic field of a magnet is strongest at the place where magnetic field lines are close to one another. The axis of earth's imaginary magnet and the geographical axis coincide with each other. The axis of earth's imaginary magnet is inclined at an angle of 15 degree with the geographical axis. The needle of a compass is a magnet. When the compass is placed in a magnetic field, a magnetic force acts on the needle and it gets deflected from its usual north–south position. Where do the manufactures use a magnetic strip in the refrigerator? Why is this magnetic strip used? Magnetic strips are used in refrigerator doors. In the absence of magnet strip, the door will not close completely. This will allow warm air from outside to enter into the refrigerator. Further, the cool air from the refrigerator will also escape. (a) Magnetic field lines leave the .......... pole of a bar magnet and enter at its .......... pole. (b) The earth's magnetic field is rather like that of a .......... magnet with its .......... pole in the northern hemisphere. (a) Magnetic field lines leave the north pole of a bar magnet and enter at its south pole. (b) The earth's magnetic field is rather like that of a bar magnet with its south pole in the northern hemisphere. 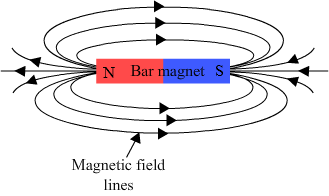 Draw a diagram to show the magnetic field lines around a bar magnet. What is a magnetic field? How can the direction of magnetic field lines at a place be determined? Magnetic field is defined as the space surrounding a magnet in which magnetic force is exerted. The direction of magnetic field lines at a place can be determined by finding the direction of magnetic force on the north pole of the magnet. Explain why, two magnetic field lines of not intersect each other. If two magnetic field lines intersect each other, the resultant force on the north pole, placed at the point of intersection, will be along two directions. This is not possible. Therefore, two magnetic field lines cannot intersect each other. When an electric current is passed through any wire, a magnetic field is produced around it. Then why an electric iron connecting cable does not attract nearby iron objects when electric current switched on through it? When an electric current is passed through a wire, it is true that a magnetic field is produced around it. However, such magnetic fields are very weak. The magnetic field produced by an electric iron connecting cable is very weak and is not enough to attract nearby objects. Moreover, metallic wires of cables are shielded with a cover that prevents magnetic field to show its effect outside the cable. The shape of the earth's magnetic field resembles that of an imaginary bar magnet. Magnet only attracts magnetic materials. Iron and steel are magnetic materials. If a plotting compass is placed near the south pole of a bar magnet, this pole attracts the north pole of the compass needle. This causes the tip of the compass to point towards the south pole. The needle of a compass is made of permanent magnetic materials. Which of the following statements is incorrect regarding magnetic field lines? (a) The direction of magnetic field at a point is taken to be the direction in which the north pole a magnetic compass needle points. (b) Magnetic field lines are closed curves. (c) If magnetic field lines are parallel and equidistant, they represent zero field strength. (d) Relative strength of magnetic field is shown by the degree of closeness of the field lines. If magnetic field lines are parallel and equidistant, they represent a uniform magnetic field. Copy the figure below which shows a plotting compass and a magnet. Label the N pole of the magnet and draw field line on which the compass lines. The magnetic field lines leave the north pole of a magnet and enter its south pole. (a) The diagram shows a bar magnet surrounded by four plotting compasses. Copy the diagram and mark in it the direction of he compass needle for each of the cases B, C and D.
(b) Which is the north pole, X or Y? (b) X is the north pole. The three diagrams in the following figure show the lines of force (field lines) between the poles of two magnets. Identify the poles A, B, C, D, E and F.
1st diagram: Magnetic field lines are beginning from A and B. The lines are repulsive also. So, A and B are north poles. 2nd diagram: Magnetic field lines are ending on C and D. The lines are repulsive also. So, C and D are south poles. 3rd diagram: Magnetic field lines are beginning from E and ending on F. So, E and F are north and south poles, respectively. (i) Copy the diagram and label the other poles of the magnets. (ii) Which is the weaker magnet? (ii) Magnet 2 is weaker because its lines are bending more. In other words, its lines are experiencing more force exerted by Magnet 1. Which effect of current can be utilised in detecting a current carrying wire concealed in a wall? The magnetic effect of current can be utilised in detecting a current carrying wire concealed in a wall. What concealed do you get from the observation that a current-carrying wire deflects a compass needle placed near it? The deflection of compass needle by a current-carrying wire shows that the wire produces a magnetic field around it. (a) What is a solenoid? Draw a sketch to show the magnetic field pattern produced by a current-carrying solenoid. (b) Name the type of magnet with which the magnetic field pattern of a current-carrying solenoid resembles. (c) What is the shape of field lines inside a current-carrying solenoid? What does the pattern of field lines inside a current-carrying solenoid indicate? (d) List three ways in which the magnetic field strength of a current-carrying solenoid can be increased? (e) What type of core should be put inside a current-carrying solenoid to make an electromagnet? A solenoid is a long coil that contains large number of close turns of insulated copper wire. The magnetic field pattern produced by a current-carrying solenoid is similar to the magnetic field produced by a bar magnet. (b) The magnetic field pattern of a current-carrying solenoid resembles with that of a bar magnet. (c) The magnetic field lines inside a solenoid are in the form of parallel straight lines. This pattern of field lines indicates that the strength of magnetic field is same at all points inside the solenoid. (e) A soft iron rod should be put inside a current-carrying solenoid to make an electromagnet. (a) What is an electromagnet? Describe the construction and working of an electromagnet with the help of a labelled diagram. (b) Explain why, an electromagnet is called a temporary magnet. (c) Explain why, the core of an electromagnet should be of soft iron and not of steel. (d) State the factors on which the strength of an electromagnet depends. How does it depend on these factors? (e) Write some of the important uses of electromagnets. It is a magnet that works on the principle of magnetic effect of current. A temporary magnet consisting of a long coil of insulated copper wire wrapped around a soft iron core is called an electromagnet. We take a rod NS of soft iron and wind coil C of insulated copper wire around it. When we connect the two ends of the copper coil to a battery, an electromagnet is formed. The iron rod inside the coil becomes a strong electromagnet on passing a current. The magnetic field produced by an electromagnet is very strong. (b) An electromagnet is called a temporary magnet because its magnetism stays only for the duration of current passing through it. All the magnetism disappears as soon as the current is switched off. (c) The core of an electromagnet must be of soft iron because soft iron loses all its magnetism when current in the coil is switched off. But if steel is used, it does not lose all its magnetism when current is switched off. Contrarily, it becomes a permanent magnet. Therefore, steel cannot be used for making the core of electromagnets. By increasing the number of turns in the coil, the strength of electromagnet can be increased. By increasing the flow of current in the coil, the strength of electromagnet can be increased. By reducing the length of air gaps between the poles, the strength of electromagnet can be increased. 1. Electromagnets are used by doctors in MRI scanners. 2. It is used for treating knee pain by using pulsing electromagnetic field (PEMF). 3. It is used in magnetic levitation trains. Name the scientist who discovered the magnetic effect of current. The magnetic effect of current was discovered by Oersted in 1820. State qualitatively the effect of inserting an iron core into a current-carrying solenoid. If an iron core is inserted into a current carrying solenoid, it acts as a magnet. If we switch off the current in the solenoid, magnetism of the soft iron core disappears. Name the rule for finding the direction of magnetic field produced by a straight current-carrying conductor. The direction of magnetic field produced by a straight current-carrying conductor can be obtained by using Maxwell's right-hand thumb rule. State the form of magnetic field lines around a straight current-carrying conductor. Magnetic field lines around a straight current-carrying conductor are in the form of concentric circles with centre at the axis of the conductor. What is the other name of Maxwell's right-hand thumb rule? The other name of Maxwell's right-hand thumb rule is Maxwell's corkscrew rule. The magnetic field inside a long circular coil carrying current well be parallel straight lines. The magnetic field inside a long circular coil carrying current will be in the form of parallel straight lines. What is the shape of a current-carrying conductor whose magnetic field pattern resembles that of a bar magnet? The magnetic field produced by a current-carrying solenoid is similar to the magnetic field produced by a bar magnet. Therefore, the shape of the given current-carrying conductor is solenoid. State three ways in which the strength of an electromagnet can be increased. (c) The magnetic effect of a coil can be increased by increasing the number of ........... increasing the ........... or inserting an ........... core. (d) If a coil is viewed from one end and the current flows in an anticlockwise direction, then this end is a ........... pole. (e) If a coil is viewed from one end, and the current flows in a clockwise direction, then this end is a ........... pole. (a) The lines of magnetic field round a straight current-carrying conductor are in the shape of concentric circles. (b) For a current-carrying solenoid, the magnetic field is like that of a bar magnet. (c) The magnetic effect of a coil can be increased by increasing the number of turns increasing the current or inserting an iron core. (d) If a coil is viewed from one end and the current flows in an anticlockwise direction, then this end is a north pole. (e) If a coil is viewed from one end, and the current flows in a clockwise direction, then this end is a south pole. Describe how you will locate a current-carrying wire concealed in a wall. We know that a current-carrying wire produces magnetic field. Therefore, we can locate a current-carrying wire concealed in a wall by detecting the magnetic field produced by the wire. It is done with the help of a compass. Describe some experiment to show that the magnetic field is associated with an electric current. We take a thick insulated wire and fix it in north-south direction. Now, we place a plotting compass under the wire. The two ends of the wire are connected to a battery through a switch. Initially, let us fix the compass needle parallel to the wire, i.e., north-south direction, if no current is flowing through the wire. If we pass a current through the wire by pressing the switch, we observe that the compass needle gets deflected from its north-south position. Again, if current is switched off, the compass needle returns to its original position. In this experiment, the deflection of compass needle by a current-carrying wire shows that an electric current produces a magnetic field around it. In other words, a magnetic field is associated with an electric current. (a) Draw a sketch to show the magnetic lines of force due to a current-carrying straight conductor. (b) Name and state the rule to determine the direction of magnetic field around a straight current-carrying conductor. (a) The magnetic field lines due to a current-carrying straight conductor are concentric circles whose centres lie on the wire. (b) Maxwell’s right-hand thumb rule is used to determine the direction of magnetic field around a straight current-carrying conductor. According to this rule, if we grasp a current-carrying wire in our right hand so that our thumb points in the direction of the current, the direction in which our fingers encircle the wire will give the direction of magnetic field lines around the wire. When thumb points upwards, the curled fingers are anticlockwise. So, the direction of magnetic field lines is anticlockwise. When thumb points downwards, the curled fingers are clockwise. So, the direction of magnetic field lines is clockwise. State and explain Maxwell's right-hand thumb rule. Maxwell’s right-hand thumb rule indicates the direction of magnetic field if the direction of current is known. According to this rule, if we grasp the current-carrying wire in our right hand so that our thumb points in the direction of current, the direction in which our fingers encircle the wire will give the direction of magnetic field lines around the wire. When thumb points upwards, the curled fingers are anticlockwise. So, the direction of magnetic field is anticlockwise. When thumb points downwards, the curled fingers are clockwise. So, the direction of magnetic field is clockwise. What is Maxwell's corkscrew rule? For what purpose is if used? If we imagine driving a corkscrew in the direction of a current, the direction in which we turn its handle is the direction of magnetic field. This rule is used to find the direction of magnetic field if the direction of current is known. When electric current flows vertically upwards, the direction of magnetic field produced is anticlockwise. Similarly, when electric current flows vertically downwards, the direction of magnetic field is clockwise. (a) Draw the magnetic lines of force due to a circular wire carrying current. (b) What are the various ways in which the strength of magnetic field produced by a current-carrying circular coil can be increased? When current passes through a circular wire, magnetic field is produced around it. The magnetic field lines are circular near the wire. At the centre, these lines are straight. State and explain the Clock face rule for determining the polarities of a circular wire carrying current. This rule is used to determine the polarity of two faces of a current-carrying circular coil. 1. If the current around the face of the coil flows in clockwise direction, that face of the coil will be south pole. 2. If the current around the face of the coil flows in anticlockwise direction, that face of the coil will be north pole. Name any two factors on which the strength of magnetic field produced by a current-carrying solenoid depends. How does it depend on these factors? If the number of turns in the solenoid is large, they will produce greater magnetism. If a soft iron rod is used as core in the solenoid, it produces strongest magnetism. (a) Draw a circuit diagram to show how a soft iron piece can be transformed into an electromagnet. (b) Describe how an electromagnet could be used to separate copper from iron in a scrap yard. (a) A soft iron piece can be transformed into an electromagnet by winding an insulated wire around it and passing current through the wire. In this process of separation, a large electromagnet is attached to a crane and moved over the scrap yard. It picks up the iron objects from the mixture and carries them to other location. Further, iron objects is dropped by switching off the current of the electromagnet coil. In this way, we will be left with copper objects in the scrap yard. (a) How does an electromagnet differ forma permanent magnet? (b) Name two devices in which electromagnets are used and two devices where permanent magnets are used. 1. It is a temporary magnet. 1. As the name suggests, it is a permanent magnet. 2. It can produce very strong magnetic force. 2. It produces a comparatively weak magnetic field. 3. Its polarity can be changed by changing the direction of current in the coil. 3. Its polarity is fixed and cannot be changed. 4. Its strength can be changed by changing the number of turns or by changing the current. 4. Its strength cannot be changed. In other options, the strength of magnetic field can change because the strength of magnetic field produced by a solenoid depends on number of turns, current and material of the core of the electromagnet. The diagram represents a magnetic field caused by a current-carrying conductor which is a circular coil. (b) decreases as we move towards its end. (c) increases as we move towards its end. (d) is the same at all points. The magnetic field inside a long straight solenoid carrying current is same at all points. The magnetic field near a long straight wire consists of concentric circles centred on the wire. The north–south polarities of an electromagnet can be found easily by using clock face rule. If the direction of current in the coil at one end of an electromagnet is clockwise, this end of the electromagnet will be south pole. If the direction of electric current in a solenoid when viewed from a particular end is anticlockwise, this end of the solenoid will be north pole. The most suitable material for making the core of an electromagnet is soft iron because its use as a core in a solenoid produces strongest magnetism. Oersted first discovered that current-carrying wire produces magnetic field around it. If a soft iron bar is inserted inside a current-carrying solenoid, the magnetic field inside the solenoid will increase. The magnetic field lines in the middle of the current-carrying solenoid are? The magnetic field lines in the middle of a current-carrying solenoid are parallel to the axis of the tube because magnetic field is uniform inside a solenoid. Because anticlockwise flow of current induces north polarity. Because clockwise flow of current in a circular loop behaves like south pole. Name the rule which you have used to get the answer. We will use right-hand thumb rule to get the answer. (a) In the straight wire A, current is flowing in vertically downwards direction; therefore, the direction of magnetic field around it will be clockwise. (b) In the straight wire B, current is flowing in vertically upwards direction; therefore, the direction of magnetic field around it will be anticlockwise. The figure shows a solenoid wound on a core of soft iron. Will the end A be a N pole or S pole when the current flows in the direction shown? End A of the solenoid will be S pole because the direction of flow of current at this end is clockwise. A current-carrying straight wire is held in exactly vertical position. If the current passes through this wire in the vertically upward direction, what is the direction of magnetic field produced by it? Name the rule used to find the direction of magnetic field. It is given that the current-carrying straight wire is held in vertical position. If current passes through this wire in vertically upward direction, magnetic field produced by it will be in anticlockwise direction. Right hand thumb rule will be used to find the direction of magnetic field. (a) what is the polarity of end A? (b) which way will the compass point then? (a) the current will flow in the clockwise direction at end A; therefore, this end will behave like the south pole. (b) The other end of the coil will behave like the north pole, and because of the repulsive force at the north pole, the compass (or point of the compass) will move away from the coil. A current flows downwards in a wire that passes vertically through a table top. Will the magnetic field lines around it go clockwise or anticlockwise when viewed from above the table? If current flows downwards in a wire that passes vertically through a table top, the magnetic field lines around it will go clockwise when viewed from above the table. This is concluded by applying right-hand thumb rule. (a) What is the polarity of end X? (b) What is the polarity of end Y? (c) Name and state the rule which you have used to determine the polarities. (a) The polarity of end X is south because current is flowing in clockwise direction at this end. (b) The polarity of end Y is north because current is flowing in anticlockwise direction at this end. (c) We have used clock face rule to determine the polarities. The magnetic field associated with a current-carrying straight conductor is in anticlockwise direction. If the conductor was held along the east-west direction, what will be the direction of current through it? Name and state the rule applied to determine the direction of current? It is given that the magnetic field associated with a current-carrying straight conductor is in anticlockwise direction. Further, the conductor was held along east–west direction; therefore, according to right hand thumb rule, the direction of current through it will be from east to west. It is given that the current-carrying conductor is held in exactly vertical direction. In order to produce a clockwise magnetic field around the conductor, the current should be passed in the conductor from top towards bottom. It is concluded by applying right-hand thumb rule. (a) top end of wire? (b) bottom end of wire? Give reason for your choice. It is given that a thick wire is hanging form a wooden table. An anticlockwise magnetic field is needed to be produced around the wire by passing current through it using a battery. Then, according to right hand thumb rule, current should pass through the wire from bottom end to top end. To execute this flow, positive terminal of the battery should be connected to the bottom end and negative terminal of battery should be connected to the top end because current flows from positive terminal to negative terminal. What happens when a current-carrying conductor is placed in a magnetic field? When a current-carrying conductor is placed in a magnetic field, the conductor experiences a force that makes it move. The force experienced by a current-carrying conductor placed in a magnetic field is largest when it is perpendicular to the direction of magnetic field. In a statement of Fleming's left-hand rule, what do the following represent? (a) direction of centre finger. 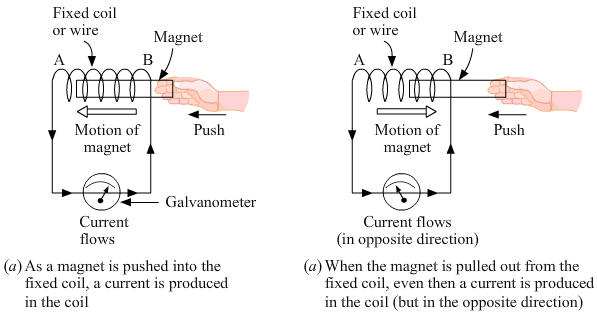 (a) Direction of centre finger represents current. (b) Direction of forefinger represents magnetic field. 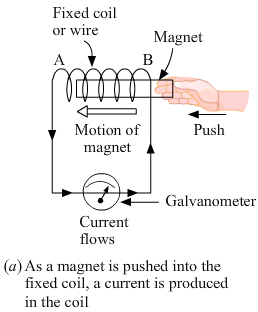 (c) Direction of thumb represents force. Name one device which works on the magnetic effect of current. Electric motor works on the magnetic effect of electric current. Name the device which converts electrical energy in to mechanical energy. Electric motor converts electrical energy into mechanical energy. A motor converts one form of energy into another. Name the two forms. A motor converts electrical energy into mechanical energy. An electric motor converts mechanical energy into electrical energy. For Fleming's left-hand rule, write down the three things that are 90° to each other, and next to each one write down the finger or thumb that represents it. (b) Forefinger represents magnetic field. (c) Central finger represents current. Name the device which is used to reverse the direction of current in the coil of a motor? The function of commutator in an electric motor is to reverse the direction of current in the coil of the motor. What is the other name of the split ring used in an electric motor? The split ring used in an electric motor is also called commutator. What is the function of a commutator in an electric motor made? The function of a commutator in an electric motor is to reverse the direction of current in the coil of the motor. Of what substance are the brushes of an electric motor made? The brushes of an electric motor are made of carbon. Of what substance is the core of the coil of an electric motor made? The core of the coil of an electric motor is made of soft iron. In an electric motor, which of the following remains fixed and which rotates with the coil? The carbon brushes remain fixed to the base of the motor, whereas the commutator (split rings) rotates. What is the role of the spilt ring in an electric motor? The role of split ring in an electric motor is to reverse the direction of current in the coil of the motor. (a) Fleming's Rule for the motor effect uses the .......... hand. (b) A motor contains a kind of switch called a .......... which reverses the current every half .......... .
(a) Fleming's Rule for the motor effect uses the left hand. (b) A motor contains a kind of switch called a commutator which reverses the current every half rotation. (a) A current-carrying conductor is placed perpendicularly in a magnetic field. Name the rule which can be used to find the direction of force acting on the conductor. (b) State two ways to increase the force on a current-carrying conductor in a magnetic field. (c) Name one device whose working depends on the force exerted on a current-carrying coil placed in a magnetic field. (a) When a current-carrying conductor is placed perpendicular to a magnetic field, Fleming's left-hand rule can be used to find the direction of force acting on the conductor. (b) The force on a current-carrying conductor in a magnetic field can be increased by increasing the flow of current in the conductor and also by increasing externally applied magnetic field. (c) Electric motor is a device whose working depends on the force exerted on a current-carrying coil placed in a magnetic field. (a) What is an electric motor? With the help of a labelled diagram, describe the working of a simple electric motor. (b) What are the special features of commercial electric motors? (a) An electric motor is a device that converts electrical energy into mechanical energy. An electric motor works on the principle of magnetic effect of electric current. In an electric motor, a rectangular coil ABCD in placed between two magnets in poles N and S. Now, current is passed through it continuously. When current is passed into the coil, it produces a magnetic field around it. The two magnetic fields interact and cause the coil to rotate. When the coil rotates, the shaft attached to it also rotates. In this way, electrical energy supplied to the motor is converted into mechanical energy. (i) The coil is wound on a soft iron core; therefore, the strength of magnetic field increases. (ii) The coil contains large number of turns of insulated copper wire. (iii) A powerful electromagnet is used in place of permanent magnet. In an electric motor, the direction of current in the coil changes once in each half rotation. An electron beam enters a magnetic field at right angles to it as shown in the Figure. Using Fleming's left-hand rule, we find that the direction of force acting on the electron beam will be into the page. The force experienced by a current-carrying conductor placed in a magnetic field is largest when the angle between the conductor and the magnetic field is 90°. The force exerted on a current-carrying wire placed in a magnetic field is zero when a current-carrying conductor is parallel to the field. Using Fleming's left-hand rule, we find that the force on wire should act vertically downwards. Electric motor converts electric energy into mechanical energy. State Fleming's left-hand rule. Explain it with the help of labelled diagrams. What is the principle of an electric motor? Name some of the devices in which electric motor are used. According to the principle of an electric motor, when a rectangular current carrying conductor is placed in a magnetic field, a couple of forces act on it and try to rotate the conductor in the magnetic field. Electric motors are used in fans, washing machines, grinders, etc. (a) In a d.c. motor, why must the current to the coil be reversed twice during each rotation? (b) What device reverses the current? (a) In a D.C. electric motor, the reversing of current in the coil is repeated after every half rotation. This causes the coil to continue its rotation as long as the current from the battery is passed through it. The rotating coil can drive a machine connected to it. (b) A commutator (split rings) reverses the current. (iii) both current and magnetic field were reversed simultaneously. (b) In what ways can a motor be made more powerful? (i) The direction of rotation of the motor will get reversed on reversing the direction of flow of current in the coil. (ii) The direction of rotation of the motor will get reversed on reversing the direction of magnetic field. (iii) The direction of rotation of the motor will not change if both current and magnetic field are reversed simultaneously. (i) If the coil is wound on a soft iron core, the strength of magnetic field increases. Applying Fleming's left-hand rule, we find that the force on the wire will act vertically upward. Is the current flowing clockwise or anticlockwise around the coil when viewed from above? The current is flowing in clockwise direction around the coil when viewed from above. Using Fleming's left-hand rule, the direction of current can be found. Which way does the wire in the diagram below tend to move? The wire in the diagram will move outwards (out of the page). If the current in a wire is flowing in the vertically downward direction and a magnetic field is applied from west to east, what is the direction of force in the wire? By applying Fleming's left-hand rule, we find that the force will act in south direction. By applying Fleming's left-hand rule, we find that the wire tends to move downwards (into the paper). What is the force on a current-carrying wire that is parallel to a magnetic field? Give reason for your answer. The force on a current-carrying wire parallel to the magnetic field is zero because the magnetic force on the wire is due to the force experienced by moving electrons in the conductor. Further, the magnetic force has rotatory effect on electron motion only. Therefore, in parallel condition, this rotating effect is zero and this results in zero force on the conductor. What should be the nature of charge on the particle if it begins to move in a direction pointing vertically our of the page due to its interaction with the magnetic field? The charge is positive in nature. On applying Fleming's left-hand rule, we find that only positive charge will experience a force pointing vertically outwards due to its interaction with the magnetic field. Name the device which converts mechanical energy into electric energy. An electric generator converts mechanical energy into electric energy. (a) which one uses a commutator (split rings)? (b) which one uses slip rings? (a) A D.C. generator uses a commutator (split rings). (b) An A.C. generator uses slip rings. Name the phenomenon which is made use of in an electric generator. Electric generator works on the principle that when a straight conductor is moved in a magnetic field, current is induced in the conductor. This phenomenon is called electromagnetic induction. Name the rule which gives the direction of induced current. Fleming's right-hand rule gives the direction of induced current. What condition is necessary for the production of current by electromagnetic induction? The condition necessary for the production of current by electromagnetic induction is that there must be a relative motion between the coil of a wire and magnet. Draw the labelled diagram of an A.C. generator. With the help of this diagram, explain the construction and working of an A.C. generator. 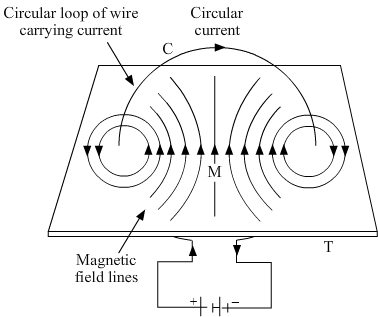 An electric generator (see figure) consists of a rotating rectangular coil ABCD placed between the two poles of a permanent magnet. The two ends of this coil are connected to two rings R1 and R2 . The inner side of these rings are insulated. Two conducting stationary brushes B1 and B2 are kept pressed separately on the rings R1 and R2, respectively. The rings R1 and R2 are internally attached to an axle. The axle may be mechanically rotated from outside to rotate the coil inside the magnetic field. Outer ends of the two brushes are connected to a galvanometer to show the flow of current in the given external circuit. When the axle is attached to the two rings, the axle is rotated so that arm AB moves up (and arm CD moves down) in the magnetic field produced by the permanent magnet. Now, coil ABCD is rotated clockwise in an arrangement as shown in the figure. 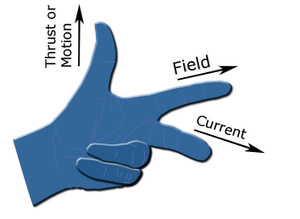 By applying Fleming’s right-hand rule, the induced currents are set up in these arms along the directions of AB and CD. Thus, an induced current flows in the direction ABCD. If there are larger numbers of turns in the coil, the current generated in each turn adds up to give a large current through the coil. This means that the current in the external circuit flows from B2 to B1. After half rotation, arm CD moves up and arm AB moves down. As a result, the directions of induced currents in both the arms change, giving rise to the net induced current in the direction DCBA. The current in the external circuit now flows from B1 to B2. Thus, after every half rotation, the polarity of currents in respective arms changes. Such a current that changes direction after equal intervals of time is called alternating current (A.C.). This device is called an A.C. generator. (a) What do you understand by the term "electromagnetic induction"? Explain with the help of a diagram. (b) Name one device which works on the phenomenon of electromagnetic induction. (c) Describe different ways to induce current in a coil of wire. (a) In case of relative motion between a source of magnetic field and conductor, current flows inside the conductor. This phenomenon is called electromagnetic induction. For example, when a bar magnet is moved towards a coil of wire attached to a galvanometer, a deflection in galvanometer needle is observed due to induced current as shown in the figure. (a) What do you understand by the terms 'direct current' and 'alternating current'? (b) Name some sources of direct current and some of alternating current. (c) State an important advantage of alternating current over direct current. (d) What is the frequency of A.C. supply in India? (a) If current flows in one direction only, it is called direct current, e.g., current generated by battery. If current reverses its direction after fixed intervals of time, it is called alternating current, e.g., current supplied at homes. (b) Some sources of direct current are dry cells, battery, car battery and D.C. generators. Some sources of alternating current are A.C. generators, power stations. (c) An important advantage of alternating current over direct current is that alternating current can be transmitted to long distances without much loss of electric energy. (d) The frequency of A.C. supply in India is 50 Hz. If a rectangular coil of copper wire is rotated in a magnetic field, the direction of magnetic field to the given side of coil changes after half revolution and the direction of induced current also changes simultaneously. What type of generator is used at Power Stations? A.C. generators are used at power stations. What change should be made in an a.c. generator so that it may become a d.c. generator? By replacing the slip rings of an A.C. generator by a commutator, we can convert it into a D.C. generator. (a) A generator works on the principle of electromagnetic induction. (b) A motor works on the principle electric generator? (a) True. Generator works on the principle of electromagnetic induction. (b) False. A motor works on the principle that a force is experienced by a current conductor when placed in a magnetic field. What is the function of brushes in an electric generator? Brushes maintain the contact between slip rings (commutator) in an A.C. generator (D.C. generator). So, the current produced in the rotating coil can be tapped out through slip rings (commutator) into the brushes. When a wire is moved up and down in a magnetic field, a current is induced in the wire. What is this phenomenon known as? The phenomenon is known as electromagnetic induction. When current is 'switched on' and 'switched off' in a coil, a current is induced in another coil kept near it. What is this phenomenon known as? This phenomenon is known as electromagnetic induction. What is the major difference between the simple alternator and most practical alternators? 1. In a simple alternator, small voltage is produced. 2. It is used in power houses. Why are Thermal Power Stations usually located near a river? Thermal power stations are usually located near a river because they require huge and continuous supply of water which is converted into steam by burning coal to turn turbines. Three sources of magnetic fields are permanent magnets, electromagnets and current-carrying conductors. A generator with commutator produces ............... current. A generator with commutator produces D.C. current. Two circular coils A and B are placed closed to each other. If the current in coil A is changed, will some current be induced in the coil B? Give reason for your answer. Yes, some current will be induced in coil B because with the change in current in coil A, the magnetic field produced by it will change. This change in the value of magnetic field will induce current in coil B. (a) Explain the principle of an electric generator. (b) State two ways in the which the current alternating current and direct current? (a) An electric generator works on the principle of electromagnetic induction. It states that when a conductor is moved in a magnetic field, current is induced in the conductor. (a) What is the difference between alternating current and direct current? (b) What type of current is given by (i) a dry cell, and (ii) a power House generator? 1. In an alternating current, the direction of current changes after equal intervals of time. 1. In direct current, the direction of current remains the same. (a) The major difference between alternating current and direct current is that in an alternating current, the direction of current changes after equal intervals of time, whereas in direct current, the direction of current remains the same. State and explain Fleming's right hand rule. Fleming's right-hand rule states that when thumb, forefinger and centre finger of right hand are held mutually perpendicular to one another, thumb, forefinger and centre finger represent directions of motion, field and current induced in the conductor, respectively. (a) current induced in a coil due to its rotation in a magnetic field. (b) force experienced by a current-carrying straight conductor placed in a magnetic field which is perpendicular to it. (a) In what respect does the construction of an A.C. generator differ from that of a D.C. generator? (b) What normally drivers the alternators in a Thermal Power Station? What fuels can be used to heat eater in the boiler? In an A.C. generator, two ends of the coil are linked to two full rings of copper called slip rings . In a D.C. generator, two ends of the coil are linked to a commutator consisting of two half rings of copper. (b) The high pressure of steam normally drives the alternators in a thermal power station. Coal, natural gas or oil can be used to heat water in the boiler to form steam of high pressure. Generator is used to produce both A.C. and D.C. currents. (d) A.C. generator has slip rings while D.C. generator has a commutator. A.C. generator has slip rings, whereas D.C. generator has a commutator. When the switch S is closed in the figure given below, the pointer of the galvanometer moves to the right. (b) stay over on the right? After some time, the magnetic field gets constant; this means that there is no relative change in the value of magnetic field. Therefore, the circuit will have zero induced current. The increase in the size of the gap, in which armature turns, has no effect on voltage. Because the relative change in the value of magnetic field is maximum in this condition. (a) electrical energy into mechanical energy. (b) mechanical energy into heat energy. (c) electrical energy into chemical energy. (d) mechanical energy into electrical energy. A D.C. generator is based on the principle of electromagnetic induction. Current induced by the process of electromagnetic induction does not depend on the resistivity of wire of the coil used. Because current flows in one direction only. In India, an A.C. source has a frequency of 50 Hz. (a) the N-pole is removed? (b) the S-pole is inserted? (c) the magnet is a rest in the coil? (a) When the N-pole of a magnet is removed, deflection will take place in left direction because the induced current will flow in other direction. (b) When the S-pole of a magnet is inserted, the deflection of galvanometer needle will take place in left direction. (c) When the magnet is at rest in the coil, no deflection of galvanometer needle will take place. It is because there is no relative motion between the coil and the magnet. Thus, the current induced is zero. When the magnet shown in the diagram below is moving towards the coil, the galvanometer gives a reading to the right. (i) What is the name of the effect being produced by the moving magnet? (ii) State what happens to the reading shown on the galvanometer when the magnet is moving away from the coil. (iii) The original experiment is repeated. This time the magnet is moved towards the coil at a great speed. State two changes you would notice in the reading on the galvanometer. (i) The effect is called electromagnetic induction. It causes production of an induced current in the coil on the movement of the magnet. (ii) The reading shown on the galvanometer will be on the left side when the magnet is moving away from the coil. The deflection of galvanometer will be more to the right side. The deflection will occur more quickly. If you hold a coil of wire next to a magnet, no current will flow in the coil. What else is needed to induce a current? A relative motion between the coil of the wire and the magnet is needed to induce current. The wire in Figure below is being moved downwards through the magnetic field so as to produce induced current. (a) moving the wire at a higher speed? (b) moving the wire upwards rather than downwards? (c) using a stronger magnet? (d) holding the wire still in the magnetic field? (e) moving the wire parallel to the magnetic field lines? (a) If the wire is moved at a higher speed, the flow of current will increase. (b) If the wire is moved upwards rather than downwards, the flow of current will reverse. (c) If we use a stronger magnet, the flow of current will increase. (d) If the wire is held still in the magnetic field, the flow of current will be zero. (e) If the wire is moved parallel to magnetic field lines, the flow of current will be zero. (i) a current is passed through coil B by plugging the key? (ii) the current is stopped by removing the plug from the key? Explain your answer mentioning the name of the phenomenon involved. (i) If current is passed through coil B by plugging key, the galvanometer pointer will move to one side. The movement of galvanometer pointer shows that a current is induced in the coil. (ii) In this case, galvanometer pointer moves to other side. This shows that the direction of induced current is reversed and then quickly returned to zero. This phenomenon is based on the principle of electromagnetic induction. A portable radio has a built-in transformer so that it can work from the mains instead of batteries. Is this a set-up or step down transformer? This is a step-down transformer that reduces voltage. What name is given to the device which automatically cuts off the electricity supply during short-circuiting in household wiring? A safety device called electric fuse automatically cuts off the electricity supply during short-circuiting in household wiring. What is the usual capacity of an electric fuse used (i) in the lighting circuit, and (ii) in the power circuit, of a small house? (i) In a lighting circuit, the usual capacity of electric fuse is 5 A. (ii) In a power circuit, the usual capacity of electric fuse is 15 A. Give the symbol of an electric fuse used in circuit diagrams. (a) A wire with a green insulation is usually the live wire. (b) A miniature circuit breaker (MCB) works on the heating effect of current. A wire with green insulation is usually the earth wire. A miniature circuit breaker (MCB) works on the magnetic effect of current. Along with live wire and neutral wire, a third wire is also used in domestic electric wiring. What name is given to this third wire? Along with live wire and neutral wire, a third wire is also used in domestic electric wiring. This third wire is called earth wire. (a) Draw a labelled diagram to show the domestic electric wiring from an electric pole to a room. Give the wiring for a bulb and a three-pin socket only. (b) State two hazards associated with the use of electricity. (c) State the important precaution which should be observed in the use of electricity. (d) What will you do if you see a person coming in contact with a live wire? (e) Explain why, electric switches should not be operated with wet hands. 1. Short circuit due to damaged wiring or overloading of the circuit can cause electrical fire in a building. 2. There is a risk of shock associated with the use of electricity. If a person touches a live electric wire, he gets a severe electric shock. In some cases, shocks can be fatal. 1. Electrical appliances should be given earth connections to avoid the risk of electric shock. 2. Household wiring should be done by using good quality wires with proper thickness and insulation. 3. Switches, fuses and circuit breakers should be connected in series with the live wire. 4. Switches in 'on' position should not be touched with wet hands. (d) If a person comes in contact with a live wire, the main switch should be turned off at once to cut off the electricity supply. Moreover, the person can also be provided with an insulated support of wood, plastic or rubber. (e) We should not operate electric switches with wet hands because water conducts electricity. Thus, touching the switches with wet hands can lead to electric shocks. At the time of a short circuit, the live wire and the neutral wire touch each other. The resistance of the circuit so formed is very small; therefore, the current flowing through the wires increases heavily. A 1.25 kW heater works on a 220 B mains supply. What current rating would a suitable fuse have? Thus, a suitable fuse would have a current rating of 10 A. If the current exceeds 10 A, the fuse wire will melt. List the colours of the three wires in the cable connected to the plug of an electric iron. What is the electric potential of the wire in a mains supply cable? The electric potential of neutral wire in a mains supply cable is zero volt. If fuse of 250 mA, 500 mA, 1 A, 5 A and 10 A were available, which one would be the most suitable for protecting an amplifier rated at 240 V, 180 W? We will first calculate the current. So, a fuse of 1 A will be most suitable. If the plastic insulation of live and neutral wires gets torn, the two wires will touch each other. Due to this direct touching of live and neutral wires, an electric short circuit occurs. In which wire in a A.C. housing circuit is the switch introduced to operate the lights? Switches are introduced in the live wire to switch off an electrical appliance. Switches connect an ​electrical appliance with the live wire. If it is switched off, there will be no danger of an electric shock. In household circuits, is a fuse wire connected in series or in parallel? In household circuits, a fuse wire is connected in series to prevent any short circuit or to discontinue the flow of current. Usually three insulated wires of different colours are used in an electrical appliance. Name the three colours. The three colours are red, black and green. The red coloured wire is live wire, black coloured wire is neutral wire and green coloured wire is earth wire. What is the main propose of earthing an electrical appliance? Earthing means to connect the metal case of an electrical appliance to the earth (at zero potential) by means of a metal wire called earth wire. It is used as a safety measure. The main purpose of earthing an electrical appliance is to avoid the risk of an electric shock. Give two reasons why different electrical appliances in a domestics circuit are connected in parallel. 1. In a parallel connection, if one of the appliances is switched off or gets fused, there is no effect on the other appliances and they keep on running. 2. In parallel connection, the same voltage of the mains line is available for all the electrical appliances. How should the electric lamps in a building be connected so that the switching on or off in a room has no effect on other lamps in the same building? The electric lamps in a building should be connected in parallel so that the switching on or off in a room has no effect on other lamps in the same building. (a) A fuse should always be places in the ........... wire of a mains circuit. (b) The earth wire should be connected to the ........... of an appliance. (a) A fuse should always be placed in the live wire of a mains circuit. (b) The earth wire should be connected to the metal case of an appliance. (a) Of what substance is the fuse wire made? Why? (b) Explain why, a copper wire cannot be used as a fuse wire. (a) A fuse wire is made of tin-plated copper because it has a low melting point. If the current exceeds a safe value, the wire melts and breaks the circuit. (b) A pure copper wire cannot be used as a fuse wire because it has a high melting point. Due to this, it will not melt easily in case of a short circuit. What type of electric fuse is used in electrical appliance like car stereos? Explain with the labelled diagram. Cartridge fuse is used in electric appliances like car stereos for their safety. It consists of a glass tube and a thin fuse wire is sealed inside it. There are two metal caps at the two ends of the glass tube. Further, the two ends of the fuse wire are connected to these metal caps. The metal caps are for connecting the fuse with the circuit in a suitably made bracket. Distinguish between the terms 'overloading' and 'short-circuiting' as used in domestic circuits. 1. An extremely large amount of current is withdrawn from the circuit when a large number of electric appliances of high power-rating are switched on at the same time or connected in a single socket. This situation is known as overloading . Short-circuiting occurs when naked live and neutral wires touch each other. In this case, the resistance of the circuit so formed is very small and thus, the current flowing through the wires becomes very large. (a) When does a fuse cut off current? How does it do it? (b) What is the maximum number of 60 W bulbs that can be run from the mains supply off 220 volts if you do not want to overload a 5 A fuse? (a) An electric current is cut off by a fuse when the current exceeds a safe value. When short circuit or overloading takes place, current becomes large and heats the fuse wire too much. The melting point of fuse wire is much lower than other conducting wires; therefore, the fuse wire melts and breaks the circuit. When the fuse wire breaks, current supply is automatically switched off. (b) Let the maximum number of bulbs be n.
Thus, 18 bulbs can be run in the given case. Explain the importance of using in a household electric circuit (i) fuse, and (ii) earthing wire. A fuse is an important device that disconnects the electricity supply when short circuit or overloading occurs. It is a short-length wire of low melting point that is used to protect the household electrical system from getting damaged. It also avoids danger of electric fires due to unusual high current. This unusual high current may be due to short circuit, overloading etc. Earthing wire is a safety wire. It connects the metal parts of an appliance to the ground. It is accomplished by thick copper wires. Earthing protects the appliance and human beings in case of insulation failure or accidental short circuit. (a) An electric iron is rated at 230 V, 750 W. Calculate (i) the maximum current, and (ii) the number of units of electricity it would use in 30 minutes. (b) Which of the following fuse ratings would be suitable for this electric iron? Thus, the value of maximum current is 3.26 A. Thus, the number of units of electricity is 0.375. (b) A fuse rating of 5 A would be suitable for this electric iron because the fuse used by an appliance should be slightly more than the normal current drawn through it. In this case, the normal current drawn is 3.26 A. What is the function of an earth wire? Why is it necessary to earth the metallic bodies of electric appliances? An earth wire is a safety wire. It connects the metal parts of appliances to the earth. The earth wire conducts the excess current to the earth, thereby reducing the risk of accidents. It is necessary to earth the metallic bodies of electric appliances to avoid the risk of electric shocks. To do this, we connect the earth wire to the metal body of an electrical appliance using a three-pin plug. By doing so, the metal body always remains at zero potential. In case the live wire touches the metal body of the appliance, the current passes directly to the earth through the earth wire. It does not need our body to pass the current; thus, we do not get an electric shock. (a) What current is taken by a 3 kW electric geyser working on 240 V mains? (b) What size fuse should be used in the geyser circuit? Thus, a current of 12.5 A is taken by an electric geyser of 3 kW, working on 240 V mains. (b) A fuse of 13 A should be used in this geyser circuit because the rating of the fuse used in an appliance should be slightly more than the normal current drawn through it. (a) Why are fuse fitted in the fuse box of a domestic electricity supply? (b) What device could be used in place of the fuses? (a) Fuses are included in circuits to stop the flow of excess currents. They are inserted in the fuse box that makes it easy to replace them. (b) Miniature circuit breakers (MCBs) can be used in place of fuses. Let n be the number of tube-lights that can be used safely. Thus, the maximum number of tube-lights that can safely be run is 30. We should use a fuse with current capacity slightly greater than the current drawn by the device. We will choose a fuse of 5 A current rating and the fuse wire will melt if the value of current exceeds 5 A. (a) In a house circuit, lamps are used in parallel. (d) When connecting a three-core cable to a 13 three-pin plug, the red wire goes to the live pin. (b) Switches, fuses and circuit breakers should be placed in the neutral wire. Switches, fuses and circuit breakers should be placed in the live wire. We should use a fuse with current capacity slightly greater than the maximum current drawn by the device. Thus, the value of correct fuse for the circuit will be 5 A and the fuse wire will melt if the value of current exceeds 5 A. A 3-pin mains plug is fitted to the cable for a 1 kW electric kettle to be used on a 250 V a.c. supply. Which of the following statements is not correct? (d) The green wire should be connected to the earth pin. (b) A 13 A fuse is the most appropriate value to use. Because the current drawn is 4 A, a fuse of 13 A cannot be considered the most appropriate. So, the correct option is 2 A because the value of fuse used by any appliance should be slightly larger than the value of normal current drawn by it. Miniature circuit breakers (MCBs) are used in domestic wiring in place of fuses. MCB contains an electromagnet. When current increases heavily, the electromagnet becomes strong enough to separate the pair of contacts and break the circuit. An air-conditioner of 3.2 kW power rating is connected to a domestic electric circuit having a current rating of 10 A. The voltage of power supply is 220 V. What will happen this air-conditioner is switched on? We will first calculate the current drawn by this air-conditioner. Now, the current drawn by this air-conditioner is 14.5 A which is very high and the fuse in this circuit is of 10 A capacity. So, when a very high current of 14.5 A flows through 10 A fuse, the fuse wire will get heated. Further, it will melt and break the circuit, thereby cutting off the power supply. Therefore, when the given 3.2 kW power rating air-conditioner is switched on, the fuse will cut off the power supply in this circuit. Three appliances are connected in parallel to the same source which provides a voltage of 220 V. A fuse connected to the source will blow if the current from the source exceeds 10 A. If the three appliances are rated at 60 W, 500 W and 1200 W at 220 V, will the fuse blow? It is given that the rating of the fuse is 10 A. It will not blow when all the appliances are used together because current capacity of the fuse is more than the value of current drawn by the device. A vacuum cleaner draws a current of 2 from the mains supply. (a) What is the appropriate value of the fuse to be fitted in its circuits? (b) What will happen if a 13 A fuse is fitted in its circuit? (a) The appropriate value of the fuse should be 3 A because the capacity of fuse used by an appliance should be slightly larger than the value of normal current drawn through it. (b) If a fuse of 13 A is fitted in in the circuit of the vacuum cleaner, it can allow very high current to flow through the vacuum cleaner. This can damage the vacuum cleaner during short-circuits and overloading. Which of the following circuits will still be dangerous even if the fuse blows off and electric iron stops working during a short circuit? Circuit (b) will still be dangerous even if the fuse blows off and electric iron stops working during a short-circuit. This is because the live wire that carries A.C. power is still is in contact with the electric iron . An electric kettle rated as 1200 W at 220 V and a toaster rated at 1000 W at 220 V are both connected in parallel to a source of 220 V. If the fuse connected to the source blows when the current exceeds 9.0 A, can both appliances be used at the same time? Illustrate your answer with calculations. It is greater than the rating of the fuse; therefore, both the appliances cannot be used at the same time. What is the main difference in the wiring of an electric bulb and a socket for using an electric iron in a domestic electric circuit? What is the reason for this difference? An earth connection is given to the socket for an electric iron, whereas no earth connection is given to an electric bulb. It is because earth connections are given to only those appliances that have metallic body, draw heavy current and can be touched. Therefore, an electric iron is provided with earth connection. However, earthing is not done with electric bulbs because we hardly touch them when they are on. (a) Explain why, it is more dangerous to touch the live wire of a mains supply rather than neutral wire. (b) Why is it safe for birds to sit on naked power lines fixed atop tall electric poles? In an A.C. power supply, the wire that carries alternating current is called live wire. So, it is dangerous to touch live wire. Neutral wire is grounded at the power station; therefore, it is not dangerous to touch neutral wire. When a bird sits on a naked power line, it only touches the power line and nothing else. The alternating current in the wire doesn’t have any path to flow through the bird to anywhere else. In the absence of a path for the current to flow, the bird remains safe. A domestic lighting circuit has a fuse of 5 A. If the mains supply is at 230 V, calculate the maximum number of 36 W tube-lights that can be safely used in this circuit. Let n be the number of bulbs that can be used safely. Thus, the required number of bulbs is 31.